It's time to have "double" the fun in this Wildwood Heritage Glen 356QB fifth wheel by Forest River. 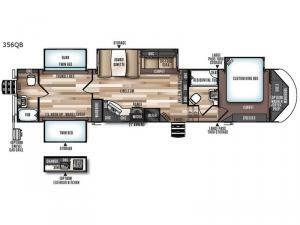 There are TWO full baths including a residential tub/shower in the front bathroom, dual entry doors with a rare rear bathroom entry into the fifth wheel, a bunkhouse with twin beds, quad slide outs, plus a custom king bed in the master bedroom, and there is more! As you step inside the main entry to your left there is a pantry, refrigerator, three burner range, microwave, and a kitchen sink. 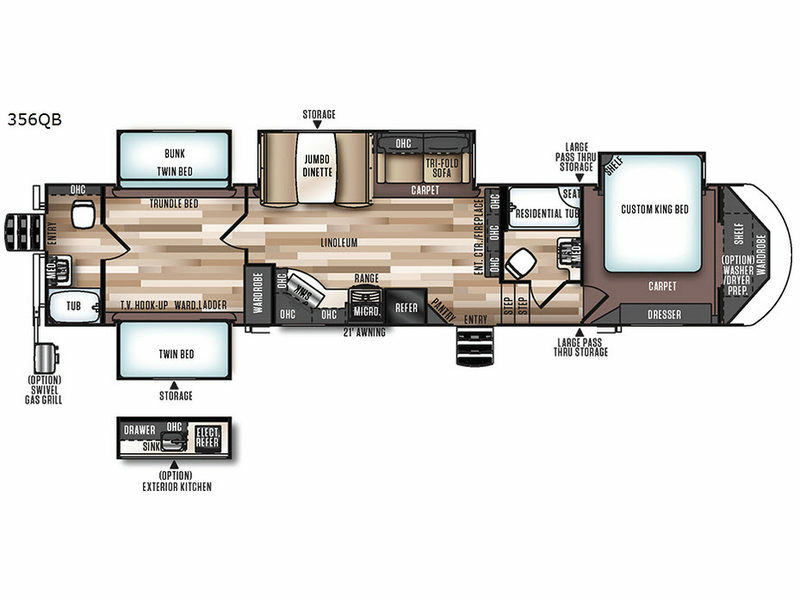 On the opposite side of the fifth wheel you will find a slide out jumbo dinette and a tri-fold sofa. Next to the sofa you can enjoy relaxing while watching the entertainment center and fireplace. There are plenty of overhead cabinets in this combined kitchen and living area. The bunkhouse has two slides. One slide offers a set of twin bunks with trundle bed below, while the other slide has a twin bunk above a wardrobe, TV hook-up, and ladder. There is an additional wardrobe for your family and friends. In the rear, you will find one of the full bathroom after you wall through the bunkhouse. There is a toilet, sink, medicine cabinet, and tub. There is also a rare rear entry door from the outside. This convenient entry allows for easy access to the bathroom or bunkhouse. As you proceed through the front of the fifth wheel, and step up the stairs, the other full bathroom is on your left. Inside this bathroom you will find a residential tub/shower with seat, toilet, sink, and medicine cabinet. The front master bedroom offers a custom king bed slide with corner shelf, and a dresser at the foot of the bed. Along the front wall you will find a full wall wardrobe with shelf, plus the wardrobe offers an optional washer/dryer prep. Outside you can enjoy the additional storage including a large pass through compartment, an optional exterior kitchen with a sink, electric refrigerator, and drawers. There is even an optional swivel gas grill that you can choose, and more.